At this past summer’s Newport Flower Show preview party, I came across a booth in the Garden Marketplace full of magnificent colors and soft silks that equally wowed the festive crowd. 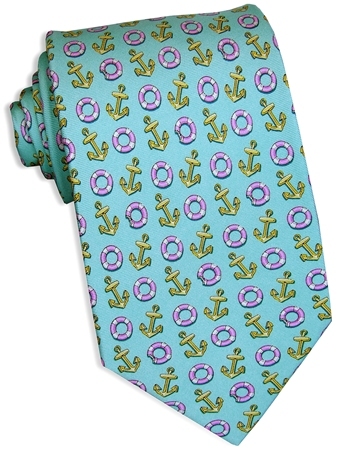 The hundreds of ties (regular and bow) by Bird Dog Bay, all 100% silk, hand-printed and handmade, sported different motifs—sail boats, Golden Retrievers, Jack Russell Terriers, birds, blue marlins, fishing hooks, anchors, armadillos—and that just barely scratches the surface. There’s a pattern for nearly ever hobby, passion and eye for good design. 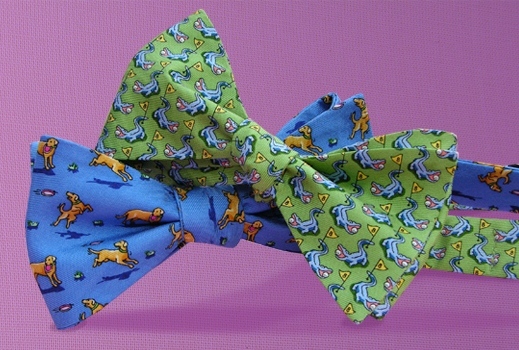 Founder and principal designer Steve Mayer, who grew up in a Chicago suburb, named the company after his “misbehaving” Fox Red Labrador Retriever, a failed hunting or “bird dog.” Today, the pair oversees the company that produces the artful ties (for boys and men–see the handy dandy “How to Tie a Bow Tie Guide below”), Fly-links (fly fishing flies turned cufflinks), collar stays, cummerbunds, caps, pocket squares and boxers. Fan Bird Dog Bay on Facebook by clicking here. It’s hard to pick a favorite, but I adore the Sail Away pattern (below), which I came to find out was inspired when Steve was on a road trip to Rhode Island last summer where he sketched this nautical beauty. Check out all the designs (including tasteful holiday patterns) and order directly from www.BirdDogBay.com. 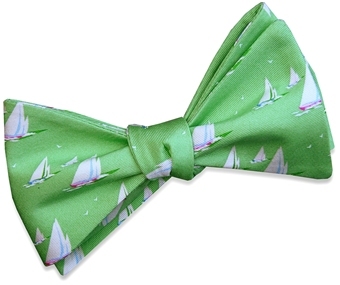 I was supplied with a sample Bird Dog Bay bow tie for this review. Opinions are my own. Entry filed under: Uncategorized. Tags: animal ties, Bird Dog Bay, Bird Dog Bay boxers, Bird Dog Bay caps, Bird Dog Bay cummerbunds, Bird Dog Bay ties, bow ties Newport ri, bow toes, celebrities in bow ties, dog ties, fishing cufflinks, fishing ties, fly fishing cufflinks, holiday ties, how to tire a bow tie, Newport Flower Show, newport ri shopping, Newport ri style, sailing ties, silk ties, Steve Mayer, Vineyard Vines.